"Leave it to a brand of ink–correction fluid to create the most entertaining YouTube campaign since the Old Spice response videos. The clip below, for Tipp–Ex, with a hunter who encounters a bear at his campsite, sets in motion a whole interactive choose–your–own–adventure game where you decide what the hunter should do to the bear by typing directions into a field above the video. 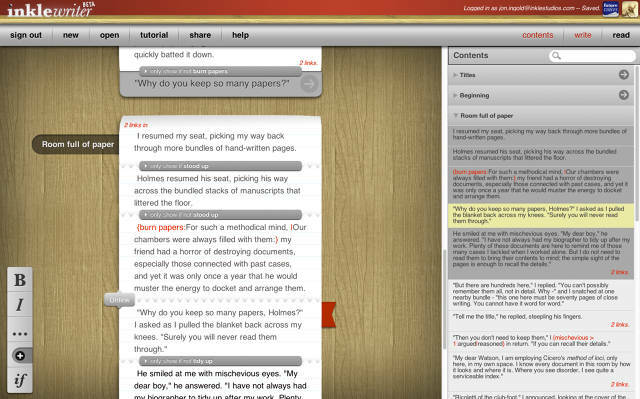 (The hunter uses Tipp–Ex to erase the word "shoots" and asks you for replacements.) It's basically Subservient Chicken all over again, but with a YouTube spin." 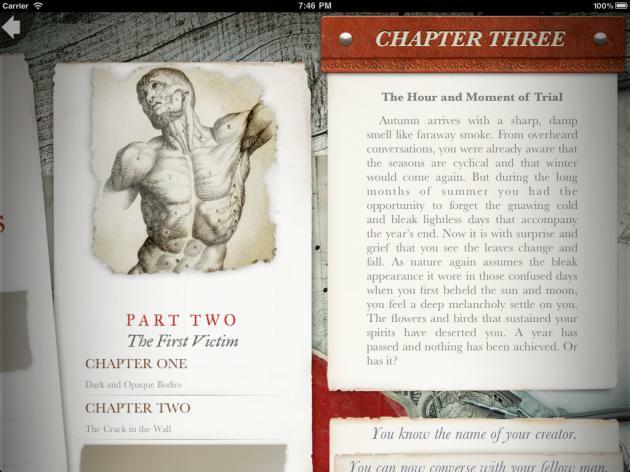 "Frankenstein, by Dave Morris, is a new kind of interactive novel, that places you right there, in Frankenstein's lab, by his side as he turns the winch and brings the spark of life to bear on his creation... Following and adapting Mary Shelley's original text, Frankenstein is a new reading experience designed from the ground up for mobile devices. Yes. I succeeded in discovering the cause of generation and life. More than that: I am myself capable of bestowing animation upon lifeless matter. Here are my lodgings... Come up, and I will show you. This unique literary app places you in conversation with Frankenstein himself as his story unfolds. He will be your guide, and you his advisor (sic). Console, counsel or condemn him: the choice is yours. 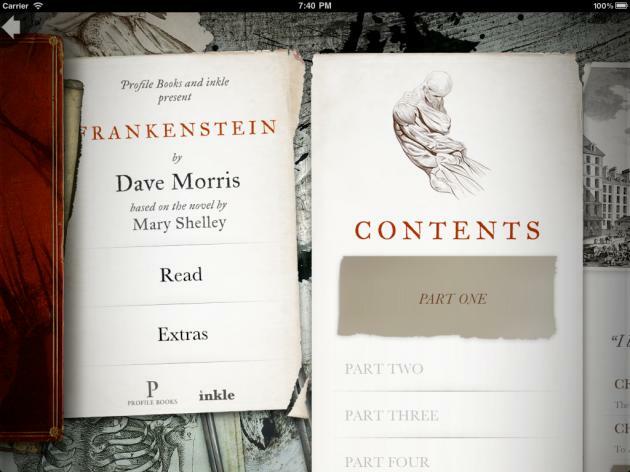 Written by best–selling author Dave Morris, designed and developed for iOS by inkle and published by award–winning publisher, Profile Books, Frankenstein is a whole new way of experiencing Mary Shelley's classic tale of terror, tragedy and revenge." 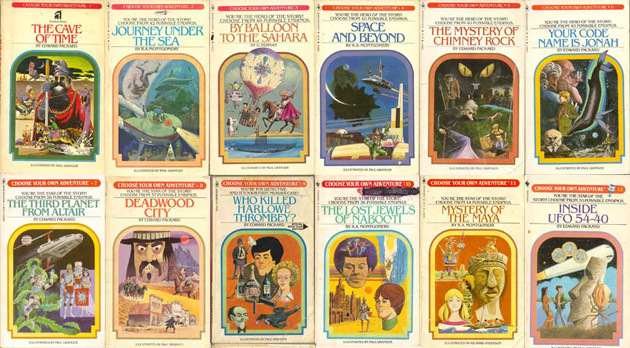 "Choose Your Own Adventure's 'you' centered decision making, and exciting pace, has been cited as an influence in numerous games and media that followed the series. Examples of Choose Your Own Adventure's reference in the gaming world includes Japan's popular Bishoujo video games, which combine narratives with gameplay and mark the beginning of 'the trend in modern gaming toward using technology to allow players control over their stories... taking on characteristics of highly detailed Choose Your Own Adventure novels,' Choose Your Own Adventure is credited with partial responsibility for the heightened popularity of Role Playing Games, including Dungeons and Dragons. Other games which have been referenced as inspired by Choose Your Own Adventure include Mass Effect II which has a narrative–based adaptive difficulty setting where potential gameplay is altered by a player's decision–making early in the game and FormSoft's Adventure Player, a portable memory stick for PlayStation that allows players to build narrative–based games. The Interactive Fiction community has also credited Choose Your Own Adventure as being a major influence of their works." "For the 2nd straight year, Juxt Interactive and No Mimes Media have teamed up to craft a hit Alternate Reality Game (ARG) for Cisco Systems' Global Sales Experience, an annual gathering of more than 21,000 executives around the world. Part action thriller, part treasure hunt, The Hunt storyline unfolded over the course of two weeks, turning thousands of Cisco employees into active players in an immersive adventure. 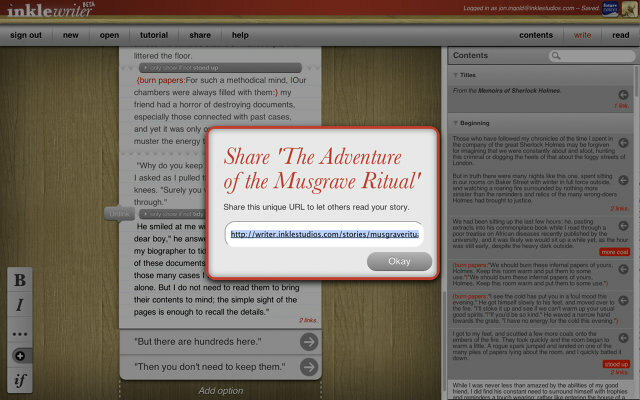 Fictional characters came to life through social media, posting Facebook and Twitter updates to drive the story in real–time, sometimes engaging participants in one–on–one conversations. The experience also incorporated cinematic video clips, email correspondence, and phone messages, and utilized an array of Cisco tools that enabled employees to communicate across departmental, cultural and geographical boundaries. In the end, participants were able to unravel the mysteries of The Hunt through collective problem solving, real–time data sharing, and seamless global collaboration, all made possible by Cisco technologies."